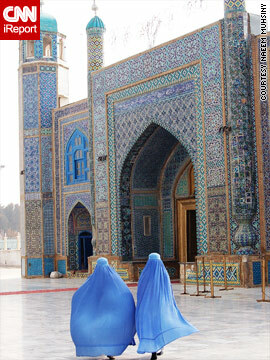 iReporter Naeem Muhsiny recently submitted these pictures he took of Afghan women in traditional Muslim garb outside the "Blue Mosque" in northern Afghanistan. Muhsiny told iReport that he feels these photos represent the struggle between religious tradition and the modern world faced by many Afghans. "Religion controls every aspect of one's life under the banner of God and secularism frees one from fear and greed, the very theory found in all four major religions," he said. "Religion divides people under different names and affiliations and secularism breaks those walls by recognizing one value and that is humanity." 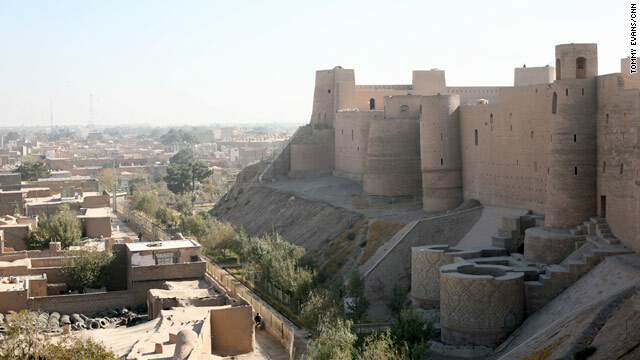 Muhsiny was stationed in Afghanistan from January 2010 through August 2011 as the country manager for Afghanistan at the American Councils for International Education, an organization that provides educational programs for Afghan youth. 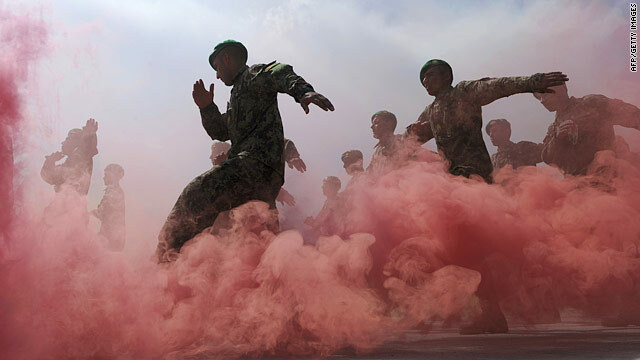 Afghan National Army officers march through colored smoke during a graduation ceremony in Kabul. Afghanistan's police and army are due to take control of security in the some areas from July and across Afghanistan by 2014. U.S. Army Sgt. Ricardo E. Maya of Corozal, Puerto Rico, a squad leader with 4th Platoon, Company D, 1st Battalion, 327th Infantry Regiment, Task Force Bulldog, keeps watch as 120mm white phosphorus mortar rounds hit the nearby ridge line during a recent firrefight that lasted more than three hours. 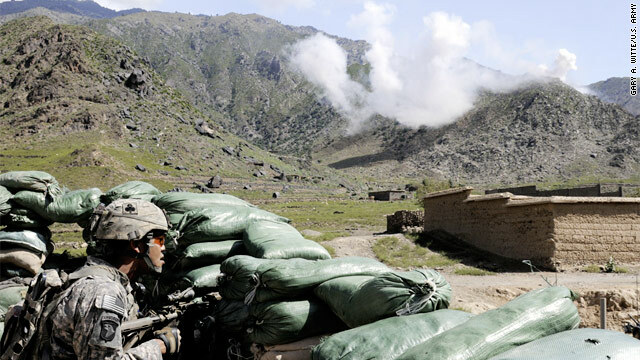 Insurgents fired rocket-propelled grenades, heavy machine guns and small arms at the Shege East Afghan National Police Checkpoint in the eastern Kunar Province. International Security Assistance Forces and Afghan National Police responded in kind with small arms, heavy machine gun and mortar fire. Neither ISAF nor ANP personnel were injured during the attack. 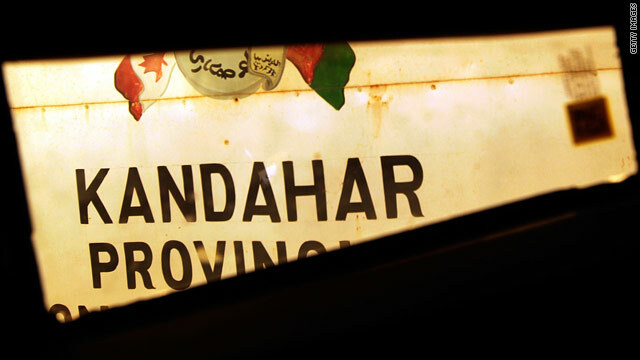 A view of Kandahar as seen through the irregularly-shaped window of a M-ATV. The M-ATV, which stands for MRAP (Mine Resistant Ambush Protected) All Terrain Vehicle, is the armored successor of the Humvee. The M-ATV and its mine-resistant brethren replaced the Humvee for transporting U.S. troops throughout Afghanistan. The windows are thicker and irregularly-shaped to help protect troops from roadside bombs and other threats. U.S. Army Sgt. 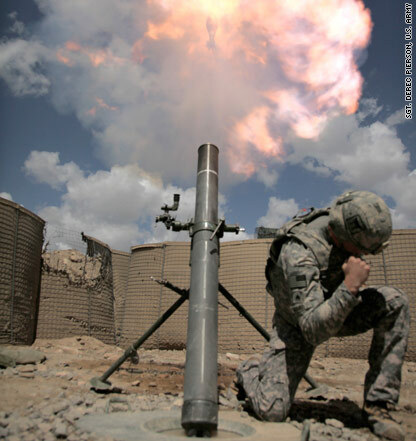 Joshua Morris shoots a mortar round during a training and certification test at a combat outpost in Afghanistan. Notice that you can actually see the round in the plume of fire and smoke. You can see the full sized image via the Department of Defense's website. U.S. Army Captain Rebecca Dimurco crouches to be closer to eye level while speaking with Afghan children during an operation to transport patients in Uruzgan province, Afghanistan. Members of Bravo company, 2nd Battalion, 1st Infantry Regiment talk with a Kuchi village elder in Hutal located in Kandahar province this week. Kuchis are Afghan Pashtun nomads which make up approximately 40 percent of the population of Afghanistan. U.S. Gen. Stanley McChrystal has said that Kandahar is his next target to be secured as part of Operation Moshtarak.